The team members were asked to design a logo that would help give an identity to the project and could be used as a cornerstone for a recognizable brand for the corridor.At the end of December, students submitted their designs to Marny Stein, developer review planner for St. Charles Parish. Stein then shared the designs with the parish’s consultation team from CPEX for review and input. 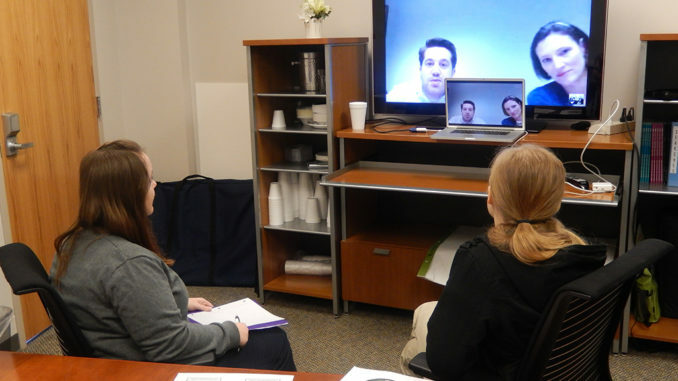 After reviewing the designs, CPEX representatives Haley Blakeman, director of implementation and Tim Basilica, vice-president of communication and outreach, conducted a video conference via Skype with Satellite Center students to give them feedback on their designs and offer suggestions for improvement. Through the meeting, digital media team members explained the thought process behind their designs to the CPEX team. Afterward the CPEX team offered suggestions and ideas to make their designs better. The comments ranged from “try exploring different font options” to “visually, this is easy to understand.” As the meeting was drawing to an end, the team members thanked the CPEX team for their time and expressed how greatly they appreciated the feedback. The digital media team working to incorporate the suggestions they received into their designs. They submitted their revised designs for review on Friday, March 28.